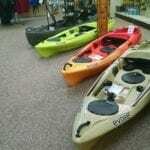 We now carry Evoke Paddlesports kayaks, models Navigator 100 (sand) and Vue 100 (Sunset and Citron) and the NuCanoe in their Frontier 10 and Frontier 12 models. Stop in and check them out. The Evoke kayaks are comfortable, with no shift bottom seating and high back support, large storage and plenty of room for gear with plenty of rod holders and other accessories. The NuCanoe kayaks are known for their stability, agility and comfort and are self bailing.